Enhance the mobility of citizen and visitors of Madrid City by facilitating different and personalized mobility information in a handy way: quick (real time), personalized (different modes of transport), and at hand (on their personal devices). To foster the use of greener transport modes: public bus, car-pooling, bike hiring, and walking modes. To integrate the user –pedestrians, travelers, drivers, etc.- into the cooperative mobility architecture as a new source of information. The Smart Crossing service encompassed within the ﬁeld of improving road safety, also integrates pedestrians into trafﬁc cooperative services. A controlled trafﬁc light crossing is equipped with cameras to detect crossing pedestrians; LED lamps to reinforce the lighting at the crosswalk, Bluetooth and 3G communications beacons for pedestrian interaction (via Smartphones) and a PCBox which supplies real time information of the crossing status. The system allows the trafﬁc light regulator to extend green pedestrian time, to provide lighting and to activate a green-light request via cellphones Bluetooth. This system is integrated with the MoveUs app being capable to activate a vibrating alert as a signal that the green phase is active. It has been deployed in Madrid (Av. 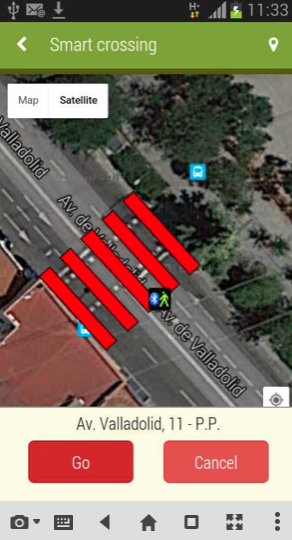 Valladolid, 11) within a controlled traffic light crossing with the support of the City Council. This service is intended to improve the quality of public transport and thus improve mobility in the city. The aim is to give traffic light priority to buses who have promptly been considerably delayed on their schedule for gradually recovering this delay without affecting the rest of traffic. The bus, through its on-board system, knows its status and location and when it detects its proximity to traffic regulators with the priority system implemented sends the request to the MoveUs platform which in turn connects to the control systems to assess and respond to the bus accepting or rejecting the request. If the application is accepted, it is communicated to the driver via the on-board console so driver can act accordingly. Do you want to participate in the trial validation? Help us to validate our innovative application. You can join the process by downloading the application and registering yourself. If you need any support or you would like to get more information contact us MoveUsapp is now available for Android and IOS. Download our App from your store and participate in the evaluation process!! !